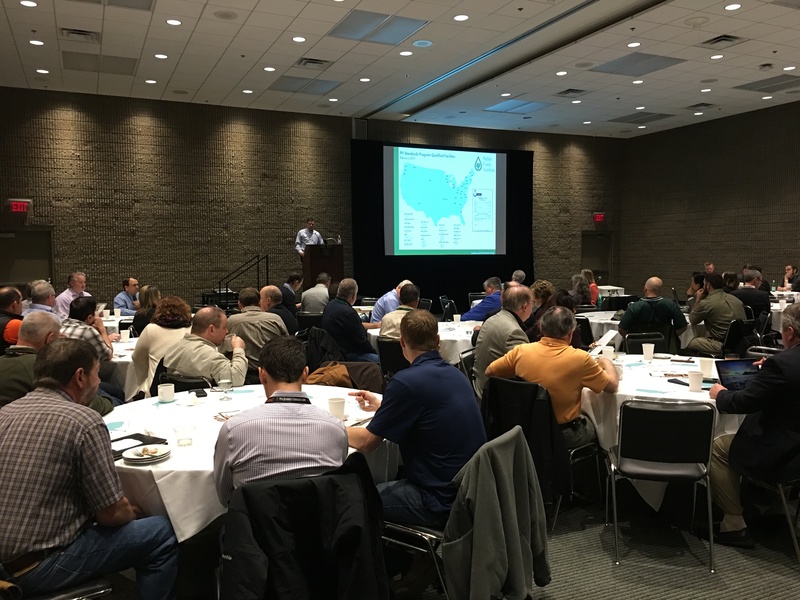 - HPBA's Cameron Downs walked attendees through the latest market data, indicating that after a blockbuster year in 2014, appliance shipments have stabilized to levels prior to that year. - Channele Wirman, lead survey statistician for the U.S. Energy Information Administration (EIA), shared the agency's Densified Biomass Fuel Report. EIA began collecting data on the pellet fuels industry, capacity and sales last year with the help of many PFI members. Ms. Wirman, an enthusiastic advocate for pellet fuels, reported on the history of the report and the agency's plans for its future. - Pat Rita of Orion Advocates, PFI's government affairs representative in Washington, analyzed the Trump Administration transition and its key federal agency appointments to positions that will have regulatory oversight over the pellet fuels industry. - Pacific Coast Pellets' Stan Elliot, chair of PFI's conference committee, gave an overview of the PFI 2017 Annual Conference, which will be held July 23-25 at the Stowe Mountain Lodge in Stowe, Vermont. Please visit PFI's website to view the collection of the 2017 Breakfast & Biomass presentations, as well as for news and updates on the PFI Annual Conference and other PFI activities. The Wood-to-Energy Check-off Initiative will be hosting a webinar for members of the pellet and biomass power industries. Presentations are scheduled for four times: twice March 15, 11:00 AM EST and 2:00 PM EST, and twice March 22, 11:00 AM EST and 2:00 PM EST. The webinar will present an overview of USDA Research and Promotion programs (commonly referred to as check-off programs), their history and benefits, and the components of the Wood-to-Energy Check-off Initiative as recommended by the Wood-to-Energy Check-off Initiative Work Group. These components include company eligibility, what is funded and how it may be used, funding safety nets, program governance, program cost, and next steps for the initiative. To register to participate, complete the form. For more information on the Wood-to- Energy Check-off Program Initiative, please visit the program's website. A new ally has emerged in our ongoing efforts to enact federal tax policy incentivizing deployment of highly efficient thermal energy systems that are fueled with biomass. This week, the Biomass Power Association reached out to indicate that the organization has put enactment of the BTU Act as one of its key "asks" during its Congressional fly-in later this month. Evidently, power facilities may be able to take advantage of the expanded credits that the BTU Act authorizes through steam generation capabilities at biomass power plants. This is welcome news as collaborating with our colleagues in the power space broadens our political reach in lobbying energy tax policy. PFI continues to meet with Congressional offices in the House and Senate to prepare for reintroduction of the BTU Act in the 115th Congress. Sessions this month in Bellmont and Long Lake explain how up to 10 municipalities and nonprofits can obtain grants to switch to wood-pellet heating. Both towns recently installed pellet-heat boilers, and representatives will offer tours of their operations at the sessions to share their results and impressions. The informational meetings are set for 4 p.m. Tuesday, March 14, at the Long Lake Town Hall, 1204 Main St. (Route 30) and 4 p.m. Wednesday, March 15, at the Bellmont Town Hall, 9 Hill Road, Brainardsville. An open house from 4 to 6 p.m. on March 14 will showcase the town's changeover to fully automated, high-efficiency wood-pellet boilers to heat municipal buildings. Attendees will learn how any building owner can get state financial incentives for switching to wood. "This is a chance to see the technology, talk to installers and experts, and learn about state funding that's available," said Leslie Karasin, Adirondack project manager for the Northern Forest Center, which is headquartered in New Hampshire and Maine. Also, visitors can learn about opportunities to convert their low-grade wood to pellets and the economic stimulus to forested regions of wood harvesting and heating with wood. The hopes of the energy company Green City Power to revive Concord Steam will be dashed if a Senate committee's recommendation holds. In a 3-0 vote Wednesday, with two absent members, the Capital Budget Committee amended and approved House Bill 368, which authorizes the state to decommission Concord Steam and find replacement heating sources for the 25 state-owned buildings it serves. The amendment broadened the financing methods that can be used to pay for the up to $25 million conversion.